The largest landfill site in Israel, named the Hiriya, has recently been turned into an innovative environmental education centre and a park.The Hiriya lies approximately halfway between Tel Aviv and Jerusalem, and is very close to Israel's main International airport, Ben Gurion airport. 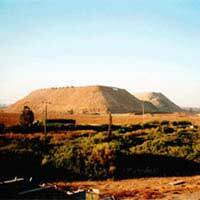 Created in 1952, and used for 44 years as the main landfill site for the metropolitan area of Tel Aviv, the site is more than half a mile long, 200 feet high, and is estimated to contain more than 560 million cubic feet of crushed and decomposing garbage waste. Martin Weyl, an entrepreneur who runs the Beracha Foundation, has been instrumental in setting up the site, and changing its status. "The first thing you see when you enter Israel by plane is this huge landfill. It's ugly, and gives a bad impression," he said in a recent interview. "The dump attracts millions of birds, and this was starting to cause a real hazard to incoming planes. We needed to find alternative solutions," Weyl said. The dump was officially closed in 1998, when alternative arrangements for disposing of trash was worked out. This included opening up new landfill sites in the south of the Country, in the Negev Desert, and making shipping arrangements with waste contractors in China. The land was saved from development by the then Prime Minister, Ariel Sharon, and has now been named after him - the Sharon Environmental Park. Weyl's vision and continuing plans for the area have led him to call the park "an environmental disneyland." Weyl and others brought in a waste company, Arrow Ecology, called by Weyl as "a fascinating experimental factory", whose function is to sort and sift through the massive pile of garbage. This is done through the use of water cleaning, in huge churning metal vats. Boaz Zadik, director of Arrow Ecology, says of the operation: "Waste is initially a dirty mixed commodity. When you separate it and wash it, it becomes bankable qualities again." As well as discovering different piles of rubbish which can be sold and recycled such as cans, bottles, plastics etc, all from a time when recycling wasn't necessarily such a hot topic, Arrow Ecology is able to generate green energy from the rubbish that they can both use and sell. Boaz Zadik explained: "the biological waste goes into a giant tank and is broken down anaerobically, and then becomes gas. We also manufacture electricity from the waste, through our generator, which is truly green energy." Weyl explained that the gas produced is sold directly to a local textile factory, which establishes a regular income stream for the park. There is also a visitors centre, which demonstrates how to recycle the stuff we all throw away into fun and artistic and useful objects. There are large benches for sitting, made from crushed cans and wheels, and a large hanging tree display of perfectly useable objects, such as chairs, that were found embedded in the garbage. The toilets feature an uncanny display of car mirrors staring back at you from the wall above the sinks! The visitor centre is open to groups of 20, and must be arranged in advance. Idit Alchazid is responsible for the environmental education programme at the Hiriya, and she offers a mixture of talks and activities within the centre, and a tour of the entire park, including a visit to Arrow Ecology.